Good interviewing skills are essential when looking for a job. 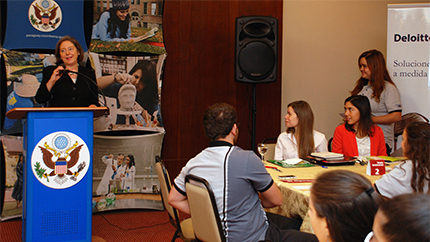 That’s why the Paraguayan Fulbright Association and the Alumni Youth Council organized two job preparedness training and networking events for 80 youth alumni. Youth Ambassador and English Access Microscholarship alumni learned successful techniques for an elevator pitch—a concise description of one’s skills and experiences that can be delivered in less than two minutes. Alumni had one week to practice their elevator pitches before applying them during speed interviews with local business leaders from the American Chamber of Commerce. The job preparedness and networking sessions were an opportunity for alumni to learn practical, real life skills to be better prepared for future job interviews.